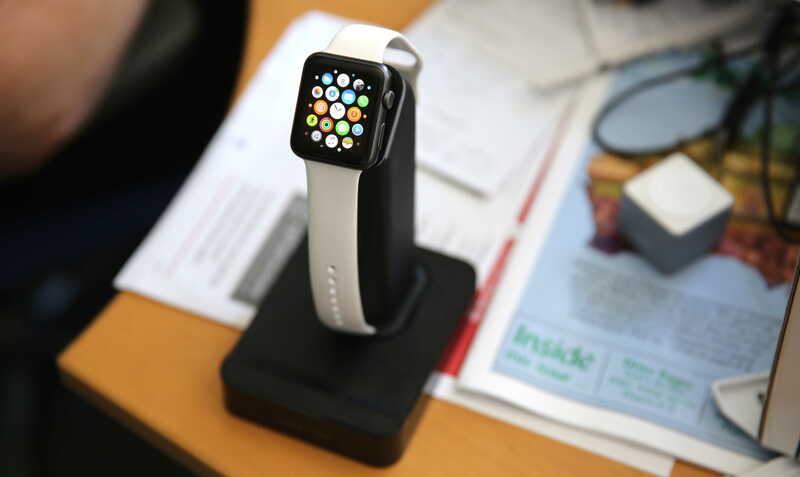 Ugreen's magnetic charging station for the Apple Watch. Let’s get the obvious out of the way first: When it’s standing there all by itself, the Ugreen Apple Watch Charger Stand looks like a giant joystick. For me, it triggered an instant flashback to the ’80s and the golden years of gaming. That nostalgic blast wasn’t necessarily a positive, though: I didn’t find the Ugreen Apple Watch charger’s design instantly appealing. In fact, it was almost game over before I even gave it a try. I’m glad I did, because it’s ultimately a handy little charging hub. Part of the reason for my initial lack of interest stemmed from personal issues. Every single one of my Apple Watch bands buckles in the middle. I’m too lazy to bother buckling them at night before charging, so the Ugreen charging stand won’t display my Apple Watch in Nightstand Mode. Instead, the timepiece just flops over the top of the charger. Ugreen Apple Watch Charger Stand is made for … video? Ugreen’s website says the charger’s unorthodox design displays your Apple Watch at the “perfect angle for viewing … you will never feel tired even after viewing for more than several hours.” Maybe some people watch hours of video on the Apple Watch’s tiny screen, but I’m just never going to do that. In fact, I’m unlikely to watch video on my iPhone while it sits on my nightstand, even though the Ugreen charger makes that simple. A lip on the front edge of the stand juts up so you can lean your iPhone at a good viewing angle. It works great, and I can see how it would be perfect for some people, but it’s just not for bleary-eyed me. If I wanted to squint at videos on my iPhone at work, however, this would be a godsend. Ugreen’s magnetic charging station for the Apple Watch. Despite the seeming incompatibility of the Ugreen Apple Watch Charger Stand with my myopic lifestyle, I found plenty to like about it. First off, it’s a reliable charging hub that’s sturdier than it appears at first glance. It looks like it would topple or drop your Apple Watch with an inadvertent tap of the hand, but it’s well-balanced and the charger’s strong magnet holds the smartwatch in place solidly. Since it comes with a built-in cable (that ends in a wall wart), it’s also good for minimizing cable hell. Two USB ports tucked away in the back — one delivering 1 amp for charging cellphones and other devices, and a beefier 2.4-amp output for juicing tablets — mean you can attach shorty cords to charge whatever you like. Priced at less than $50, it’s also a bit of a bargain for an MFI-certified Apple Watch charger. (MFI certification means the charger meets Apple’s exacting standards, so you don’t need to worry about frying anything.) Apple’s own Apple Watch charging cables cost $30, so for a little bit of extra coin you can put a more functional charging hub on your desk or your bedside table. The design of the Ugreen Apple Watch Charger Stand isn’t for everyone. But if watching video on your iPhone (or god forbid, your Apple Watch) is your game, it’s a definite winner. 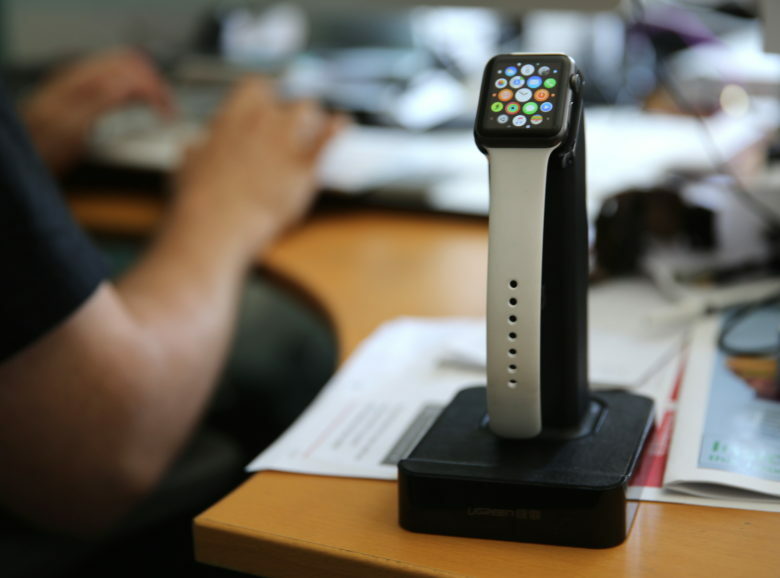 If you just want a spare Apple Watch charger, it’s a contender. Paracable provided Cult of Mac with a review unit for this article. See our reviews policy and check out more stuff we recommend in our Best List reviews.